More than 27 million business cards are printed every day, according to The Design Inspiration. 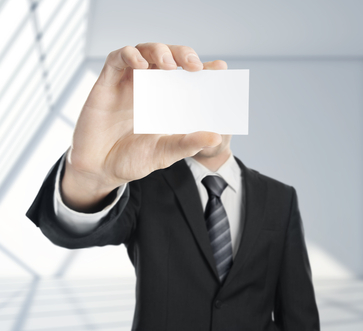 Even with new technology, business cards have yet to become extinct. But just because business cards are being made, doesn’t mean they’re also being kept. Make sure your cards make it into the right hands — and stay there — with these tips. Since you only have a few inches of area on which to talk about your company, the goal is not to deliver a lot of information, but to create a professional image, says Entrepreneur. Create a business card that reflects your business and generates curiosity about it. It’s not always necessary to include your social media sites. Those sites, such as Facebook and Twitter, should be prominently noted on the home page of your website, if you use them heavily for marketing. Two optional pieces of information you can include are a company slogan and any professional recognition. If the slogan is part of your brand, then include it on the card. If it’s just a catchy phrase, it may just be taking up space. A note about professional recognition, such as “Voted Best in Customer Service by J.D. Power in 2010” can immediately instill confidence and entice people to learn more about your company. Your logo should be the focus of the card. It’s the centerpiece of your brand. Layout the rest of the card around the logo. Use colors and fonts that match your company’s image. The design of a business card for a caterer that specializes in cuisine for children’s parties will have bright colors and creative fonts. That won’t work for a medical equipment supplier who may have a more traditional card with a simple, muted background. A good start is to look at the competition’s cards to see what image their cards portray. The Huffington Post is emphatic that you never use clip art. This was popular years ago, but now detracts from the professional image of the card. Also stay away from stock photos. A generic photo of a happy, smiling customer can look like a bad commercial. If you have no relevant images to work with, leave them off your card completely. If it’s in your budget, consider employing a graphic designer who is familiar with business card design. Once you have the design files from them, it’s an easy matter to turn them into business cards. Many companies have tools to help upload your design and print the cards. Overnight Prints design tools walk you through the process step by step from loading your design to selecting the paper stock. Whether you used a graphics design resource or created a layout yourself, you can easily get your cards printed yourself. Use a QR code so people can easily get to your company website. Use a special shape, such as a car silhouette for a detailing business. Use thermographic printing which creates raised lettering on the card. Use texturing to make the card more interesting. Guest post by Marianne Lamb: Marianne is a graphic designer and Web developer who likes to write on the side. These are great tips! I’ve used a QR code in the past on my business cards, and I found that they are excellent at helping the people you meet land on a specific page of your website. Thanks for sharing.